The progressive creationist Dr Hugh Ross has written a new book, A Matter of Days, published again by the once dependably-biblical NavPress, the publishing arm of Navigators. This is the latest in a long line of works trying to add billions of years to the Bible, with the inevitable consequences of a local flood and pre-Adamite soulless hominids. See also What does Ross really believe? This book was published almost at the same time as my book, Refuting Compromise, so it’s hardly surprising that Ross makes many arguments that are already addressed in my book. However, because his introductory chapter was online and made false attacks against biblical creationists (aka young-earth creationists/YECs) while playing the martyr, I have already critiqued the introductory chapter in this article. And most of the claims I address in this new article are covered in depth in Refuting Compromise chapter 7. Ross frequently makes claims about the meaning of the Hebrew, but he also often errs in these claims. Examples include his claim that the word ‘high’ was absent from the original Hebrew in Genesis 7:19 and totally botching a learned-sounding technical point about Hebrew verbs. As Dr Russell Humphreys showed, Ross bluffs about his knowledge of Hebrew, which is virtually non-existent—see here. ‘You are to keep My statutes. You shall not breed together two kinds of your cattle; you shall not sow your field with two kinds of seed, nor wear a garment upon you of two kinds of material mixed together’ (NASB). In all these cases, the word kind is not mîn at all, but kil’ayîm! So Ross has actually tried to argue for a meaning of a word that is not even in the text he cites! Such mistreatment of the Hebrew raises serious questions about Ross’s credibility, but also that of church leaders so eager to support his compromise—have they done any checking at all on Ross’s claims? Kil’ayîm is the dual form of kele’ in the original sense of separation. Hebrew has not only singular and plural nouns, but also the dual, for exactly two, which is why the NASB is most accurate here. And the term fits well with the YEC teaching that these different breeds Moses told the Israelites not to breed were originally separated from a single created kind. That’s why it would be possible to breed them. Also, many of these ritual purity laws were supposed to symbolize the purity of the Messianic People up to the time of Christ. They of course likewise the same kind as Gentiles, descended from Adam and Eve via Noah. See also Genesis correctly predicts Y-Chromosome pattern: Jews and Arabs shown to be descendants of one man! Or: A brief history of the Jews. Ross uses even the most unreliable evolutionary sources to discredit YECs. He even cites with approval someone as thoroughly discredited and Bible mocking as atheist Ian Plimer, without any caveats. Many anticreationists have charged that YECs must believe in evolution more strongly than evolutionists, for example the atheistic non-biologist Dr Lawrence Lerner. The basis is that we believe that comparatively few kinds of animals on board the Ark gave rise to many more varieties. Note first that in the introductory chapter, Ross professed to be the peacemaker while complaining about how nasty YECs were to him. But here is yet another example of the way he is only too happy to throw out insults against creationists. Scientific advances on many fronts increasingly support an “interventionist” (that is, miraculous) view of life’s origin and development [Ref. to his own origin of life book]. Yet, increasingly, young-earth creationist leaders oppose such advances as if these advances are driven by evolutionary ideology. This is a bizarre statement, since CMI has a lot of articles opposing chemical evolutionist theories of the origin of life and supporting the design in creation. And as we have often pointed out, his billions of years are totally based on geological and astronomical evolutionary ideology—see Hugh Ross Exposé. Perhaps the most stunning irony of the creation-day controversy lies buried―but alive―in young-earth creationists’ literature. As the following paragraphs show, those leaders who have levelled some of the most stinging criticisms at old-earth creationists, accusing them of being evolutionist (theistic or otherwise) [ref.― note how he here alleges that YEC leaders sometimes claim that OECs are atheists (! )], are actually forced by their own interpretation of Scripture to be hyperevolutionists. Their confidence in the efficiency of natural process evolution exceeds even that of the most ardent, nontheistic evolutionists. Ross manages to overlook our oft-stated simple explanation that not all variation is evolution. Rather, for goo-to-you evolution to work, the variation must increase the information content of the genome. However, the changes touted in most evolutionary ‘proofs’ involve sorting or loss of information. We have already explained how new varieties are produced by sorting out the information already created, and natural selection reduces the information. See How information is lost when creatures adapt to their environment. This is even less excusable for Ross, because his own staffer Fuz Rana cited the very article this came from, Bears across the world …, in a radio broadcast—see this section. We also published on the information issue in What is Evolution? My first book Refuting Evolution has a diagram explaining variation within a kind by the well-known YEC term ‘creationist orchard’ (see Contrasting the Models). But Ross still persists in advocating a ‘creationist lawn’, while failing to see the difference between the creationist orchard and ‘evolutionary tree’. So if creationists believe in ‘rapid evolution’, then so do some progressive creationists. This shows that Ross’s ‘fixity of species’ view is not even in the mainstream of his own belief system. His advocacy of this untenable view unfortunately serves to bolster the efforts of atheists in denouncing YECs. Furthermore, a major work of the Intelligent Design Movement,2 in fact one to which Ross himself was a contributor, published a chapter defining kinds far broader than species by YEC microbiologist Dr Siegfried Scherer. Evidently Dr Scherer’s basic type definition involving hybridization was acceptable to the ID people Ross often tries to curry favour with, and who are mostly not YEC. Dr Scherer’s definition of the ‘basic type’ included any creatures that could hybridize up to the point of true fertilization, or could hybridize with the same third creature. Other genera in the group are much more alike than the two that produced the offspring in Hawaii, which suggests that the 12 living genera might have all descended from the original created kind. That is, even such different genera within a family as the false killer whale and bottlenose dolphin hybridize, so are part of the same created kind. Therefore it makes perfect sense that the other genera in this family that are even more similar are also part of this kind. One must ask, however, whether humanly contrived breeding experiments reflect what occurs under natural conditions. According to those who study animal behavior, they do not. This last sentence is pure assertion. In any case, since when does Ross care about consensus of biological opinion? If he went by majority vote in biology, as he does in astronomy and geology, he would be an evolutionist! In any case, what is “natural”? The wholphin was a surprise, not a ‘humanly contrived breeding experiment.’ And the other animals mate quite happily if they are together. The only reason they don’t normally mate is that they are isolated from each other. Ross misses the whole point about these hybridization experiments. He has no basis to deny that animals that hybridize, especially if they produce fertile offspring like the wholphin, are in the same created kind. Rather, animals like the false killer whale and bottlenose dolphin show how much variety is possible by purely natural means from the same kind—no one bred these creatures! All that was required was the isolation of small populations with different fractions of the originally created genetic information. Natural selection and sexual selection would also have acted on these to ‘fine-tune’ the results, by removing more information. Ross’s misunderstanding of genetic variation has baneful consequences when he tries to explain the origin of human people groups (‘races’). These can be explained by the isolation of small people groups when God confused the languages at Babel. Each group contained a fraction of the total gene pool. This helped to fix certain characteristics and produced the different people groups (‘races’) we see today. Sun sensitivity works poorly as a selection effect. … Evidence of how weakly natural selection favors one skin color over another comes from the observation that dark-skinned Eskimos live in the Arctic and fair-skinned Greeks on the Mediterranean isles. These findings imply that natural selection cannot explain the development of racial diversity over just a few tens of thousands of years. At the risk of adopting a “God-of-the-gaps” approach, I can suggest an alternative explanation. Given that Genesis 11 so explicitly describes God’s personal intervention in breaking up destructive unity and in motivating people to spread through Earth’s habitable land masses, God may have done more than diversify language at the time. He possibly may have introduced also some external changes—those we recognize as racial distinctives—to facilitate the peoples’ separation. … God might have intervened … by miraculously introducing something new, in this case new genetic material that would generate racial distinctives. This is why both Eskimos and native equatorial South Americans have mid-brown skins instead of having developed very light or very dark skins—the relevant genetic information is simply not present. Such ‘people groups’ today are highly specialized, with less genetic variety than the brown-skinned offspring of African/European unions (and Adam and Eve), which is why they produce offspring of limited variety. But Ross postulates direct divine intervention at Babel to introduce ‘racial’ traits into separate populations. The Bible doesn’t even hint at this. Ross admits that it’s a ‘God of the gaps’ explanation. This would be unnecessary if he had understood basic creationist literature. This should not be taken as an indication that there is anything wrong in different people cooperating and mixing, as in trade or marriage. But his ideas do in fact smack of 19th-century racism. During that time, some individuals refused to recognize the equality of all humans, especially when it pertained to intellectual and spiritual matters. These racists believed that not all races of humans had descended from Adam and Eve. Only members of their race were thus blessed, and they considered it futile to send missionaries to soulless dark-skinned people. Ross’s idea almost implies that God designed racial prejudice, to aid separation at Babel. Finally, his postulate of ‘extra genetic material’ seems to reinforce the prejudicial notion that there are in fact substantial genetic differences, differences in kind, between people groups. But virtually all modern geneticists acknowledge—due to biological fact, not ‘political correctness’—that the genetic differences are so trivial as to make the whole concept of ‘race’, when applied to humanity, biologically meaningless. See also Q&A: Racism and Refuting Compromise chapter 9. Not only according to YECs, but the clear teaching of Genesis 1:30! I address this further here. Carnivorous activity (considered evil because it involves animal death), they assumed, would have been one of the consequences of human sin. Based on this perspective, all meat-eating creatures alive now and evidence in the fossil record must have evolved rapidly (in several hundred years or less) from the plant eating creatures God made during the creation week. And since God is no longer “creating”, they must have evolved strictly by natural processes. Although all bears have teeth designed for eating meat, their diet consists mainly of plants. But maybe their teeth are designed perfectly well for what they do—eat plants—while in this fallen world they are also good for eating animals sometimes. 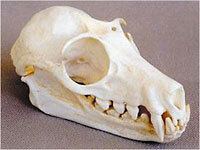 And this skull (see picture) is of an animal classified as a ‘carnivore’ because of its teeth—yet it’s a fruit bat! So before the Fall, many attack/defense structures could have been used in a vegetarian lifestyle. For example, even today, some baby spiders use their webs to trap pollen for food (see Pollen-Eating Spiders), and there was the case of The lion that wouldn’t eat meat, the vegetarian piranha called the pacu and a vulture that eats mainly palm nuts. In fact, in Indonesia today, people feed vegetables to their pet dogs because meat is so expensive. Even many poisons actually have beneficial purposes in small amounts—see Understanding Poisons from a Creationist Perspective. However, in other cases, information losses can result in an organism becoming an obligate parasite—see Pathogens and creation. We have also pointed out that some structures do seem to be designed for defense/attack. In this case, there was no new design after Creation Week. Rather, God foreknew the Fall, so He programmed creatures with the information for design features for attack and defense that they would need in a cursed world. This information was ‘switched on’ at the Fall. There should be no problem believing that the Master Programmer can switch information on and off. After all, at conception, the fertilized egg has all the information necessary to code for your physical potential. But skin cells don’t express the information for blood, bones, muscles, eyes, etc. So during the development of the embryo, as cells multiply, information is switched off in an orderly manner. (The importance of stem cells is that not all of the information is switched off). A young-earth interpretation of the Genesis Flood exacerbates this speculated speciation problem. According to this interpretation, a global deluge wiped out all land-dwelling, air-breathing life on earth, except those pairs on board Noah’s Ark, and all Earth’s fossils and geological features resulted from this relatively recent cataclysmic event. Of course, YECs believe that the Flood wiped out only animals that breathed through nostrils (Genesis 7:22). So it didn’t wipe out insects or marine creatures off the Ark, although many clearly perished. We explain this at How did the animals fit on Noah’s Ark? We also point out that a number of fossils and features were the result of post-Flood catastrophes, e.g. the woolly mammoths (that is, not all fossils formed during the Flood). We point out that at most, 16,000 animals would have been needed, so there was plenty of room to store food and water and take care of the waste products. Hibernation was a possibility but not necessary. See again How did the animals fit on Noah’s Ark? However, the fossil record documents the existence of a half billion species or more [ref.]. This is preposterous, repeating a claim he made in his earlier book The Genesis Question, which I address in Refuting Compromise ch. 8. Fact: the actual number of fossil species recovered is only about 200,000. This includes just over 190,000 marine-invertebrate species,4 and about 10,000 species of fossil vertebrates.5 If we correct for sampling bias, and even accommodate some uniformitarian assumptions about past diversity of life, we project the existence of perhaps 1.2 million fossil species.6 However, recent evidence shows that many fossils that have been identified as different species are really the same species. This means that the number of fossil species has been inflated by an estimated 32–44%.7 We can see that Hugh Ross exaggerates the number of fossil species in the earth’s crust by a factor of at least 400! However, such huge numbers are influenced by evolutionary bias, as is the common evolutionary claim that 99% of species have become extinct. For evolution to be true, there would have to have been innumerable transitional forms between different types of creature. Therefore, for every known fossil species, many more must have existed to connect it to its ancestors and descendents. This is yet another example of evolutionary conclusions coming before the evidence. Really, the claim is an implicit admission by evolutionists that large numbers of transitional forms are predicted, which heightens the difficulty for evolutionists, given how few there are that even they could begin to claim were candidates. Ross’s use of evolutionary conjectures (about how many species may once have lived) to attack the global Flood is ironic. This is because using these numbers involves an implicit (if unwitting) acceptance of the very evolutionary transformism which Ross spends so much time denying and attacking elsewhere. He cannot have his cake and eat it, too. The source of Ross’s astronomically-inflated numbers is the husband and wife partnership Paul and Ann Ehrlich,8 who cite an antiquated (1952) number mentioned by George Gaylord Simpson. The latter had casually ventured a guess at the number of species that had ever lived. The Ehrlichs acknowledge that their guesstimate is ‘a ballpark guess’ (if it even deserves to be dignified that much). And it’s incredible that Ross would rely on such a demonstrably unreliable source as the Ehrlichs. Paul, a butterfly specialist, is most famous for advocating fanatical population control ideas, and for the falsified prophecies of doom by mass starvation and resource depletion made in his 1968 book The Population Bomb. But he and his wife still promote their radical ideas, including radical pro-abortion policies. (See Melbourne Atheist: The Exterminator for a refutation of ideas akin to the Ehrlichs.) It is unfortunate that Ross has accepted this totally-conjectured number from this credibility-lacking source as ‘gospel truth’, and presented it to his readers as such. Even worse, he has also failed to accurately inform himself and his readers of the small actual number of fossil species that have been discovered. At least 5 million species are alive on earth today [ref. ], and at least 7 million lived in the era immediately after the Flood, as young-earth interpreters date it. The speciation problem intensifies from that point. Shortly after the Flood, according to a young-earth perspective, many or most of the 30,000 species on board—dinosaurs, trilobites, and others—went extinct. Does Ross even know what a trilobite is? It was a marine creature, and an invertebrate (did not breathe through nostrils)! Thus it was not one of the passengers on board the Ark. As a bottom-dweller, it would have been one of the first creatures to be buried, which explains why they are found so low in the fossil record. Indeed, the Flood could have been responsible for their extinction. There is nothing primitive about them—indeed, their eyes look like they were designed by a master physicist (as indeed they were—see Trilobite technology). So the remaining few thousand species must have evolved by extremely rapid, hyperefficient natural processes into millions of species. Ross has conflated (old) creationist estimates of the number of land vertebrate species (a few thousand) with numbers of total species (millions). Obviously, creationists don’t think that the land vertebrates gave rise to all species, including the non-vertebrates, plants and microbes! It’s hard to believe that these numbers were confused accidentally. In fact, only about 2% of the two million known extant species are vertebrates.10 This number is further reduced when the 25,000 marine vertebrates (mainly fish)11 and most of the four thousand amphibians12 are discounted, since God told Noah to take on board only land animals—marine creatures don’t need preservation from a flood! So it is hardly startling to believe that 8,000 kinds of land vertebrates represented on board the Ark could give rise to the 11,000 living species, even if some of the Ark kinds have become extinct. Confidence in the superefficiency of biological evolution makes some young-earth creationists’ refusal to consider other options on the time scale more comprehensible. If Darwinian processes could work as smoothly and rapidly as they believe, a millions- or billions-of-years-old earth would seem to remove any need for God’s involvement in the creation and diversification of life—the opposite conclusion to the one these Christians wholeheartedly intend to defend. This is nonsense. YECs oppose long ages because Scripture does! If Scripture taught long ages, then that’s what we would believe. But if Scripture did so, then how come no-one saw this until the rise of such ideas in ‘science’? And those who talk so much about ‘open-minded investigation’ are closed to the idea that Scripture should be the final authority on earth history, and that scientific theories about the past must conform to this eyewitness record. Also, Ross’s claim betrays a willing ignorance of creationist literature as well as ignorance of evolution/variation, as shown above. Many years before Ross wrote any of his books, leading creationists like Dr Duane Gish made it very clear that they believed the earth was only thousands of years old, on both biblical and scientific grounds. But Gish also strongly pointed out that evolution would be impossible even if billions of years were granted, e.g. Further, the information-losing processes that creationists have repeatedly shown to characterize the inherited changes in living things would make things worse for evolution, not better, if more time were available. The accumulation of mutational copying errors, and the culling of information by natural selection, leads populations ever closer to extinction, not to uphill evolution. So if we are promoting matters that logically imply that vast ages are the enemy of evolution, how can we be said to be afraid of billions of years because they aid evolution? Ross’s new book A Matter of Days has nothing new of substance. Rather, it’s a rehash of his old false claims about creationist teachings and motivation, and a willing ignorance of the principles of variation within a kind. The only real new thing is another case of sloppiness in Hebrew. We have the biblically-required plurality of witnesses that in January 2004, Ross, at a church in his native Canada, confidently announced several times that within 12 months of the publication of this new book the debate within the church about the age of the earth would be finished in his favour. This will only happen if Christians fail to check Ross’s claims against Scripture. Bradley, W.L. and Olsen, R.L., The Trustworthiness of Scripture in Areas Relating to Natural Science, in Radmacher, E.D. and Preus, R., Hermeneutics, Inerrancy, and the Bible, Zondervan, Grand Rapids, MI, p. 290, 1984. Return to text. Scherer, S., Basic Types of Life, p. 197; ch. 8 of Dembski, Wm. A., Mere Creation: Science, faith and intelligent design, Downers Grove, IL, 1998. Return to text. ReMine, W.J., The Biotic Message, St Paul Science, St Paul, MN, 1993; see review. Return to text. Raup , D.M., Species diversity in the Phanerozoic, Paleobiology 2:279–288, 1976. Return to text. Padian, K. and Clemens, W.A., Terrestrial vertebrate diversity, In: Phanerozoic Diversity Patterns, Valentine, J.W. (Ed. ), Princeton University Press, New Jersey, p. 43, 1985. Return to text. Signor, P.W., Real and apparent trends in species richness through time, In: Phanerozoic Diversity Patterns, Valentine, J.W. (Ed. ), Princeton University Press, New Jersey, p. 146, 1985. Return to text. Sohn, E., The fossil files, New Scientist 179(2409):32–35, 2003. Return to text. Ehrlich, P.R. and Ehrlich, A.H., Extinction, Ballantine, New York, p. 26, 1981. Return to text. May, R.M., How many species are there on Earth? Science 241:1441, 1988. Return to text. Burnie, D., ‘Animal’, Microsoft® Encarta® Online Encyclopedia 2002, <http://encarta.msn.com>. Return to text. James W. Orr, ‘Fish’, Microsoft® Encarta® Online Encyclopedia 2002, <http://encarta.msn.com>. Return to text. Burnie, D., ‘Vertebrate’, Microsoft® Encarta® Online Encyclopedia 2002, <http://encarta.msn.com>. Return to text. Gish, D.T., Evolution: The Fossils Say No! Creation-Life Publishers, San Diego, CA, 2nd ed., p. 43, 1973. This book has been superseded by Evolution: The fossils STILL say NO!, Institute for Creation Research, El Cajon, CA, USA, 1995, but the 1973 book shows that Ross’s claim has no basis whatever. Return to text.